3.6 x 2.9 x 1.5 cm. This is the "classic" combo that all collectors know of from Erongo: aquamarine and schorl tourmaline. With this specimen from the collection of Marty Zinn, you have an aquamarine that is UNUSUALLY fine and gemmy for the locality - they typically are no competition for the more common Brazilian and Pakistani aquas, but this one is truly gemmy. And, it is doubly-terminated to boot! 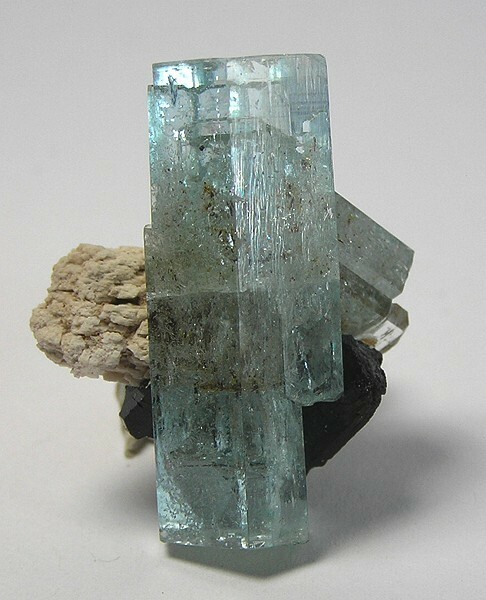 The crystal sits on a "base" made up of another aquamarine crystal, some feldspar and a schorl crystal.